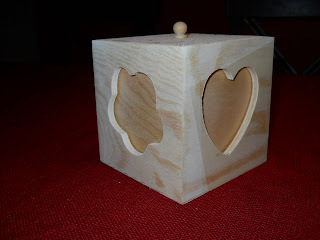 I figured that since Robin had shared her recent craft fail.. that I would share a loooong story of mine too! 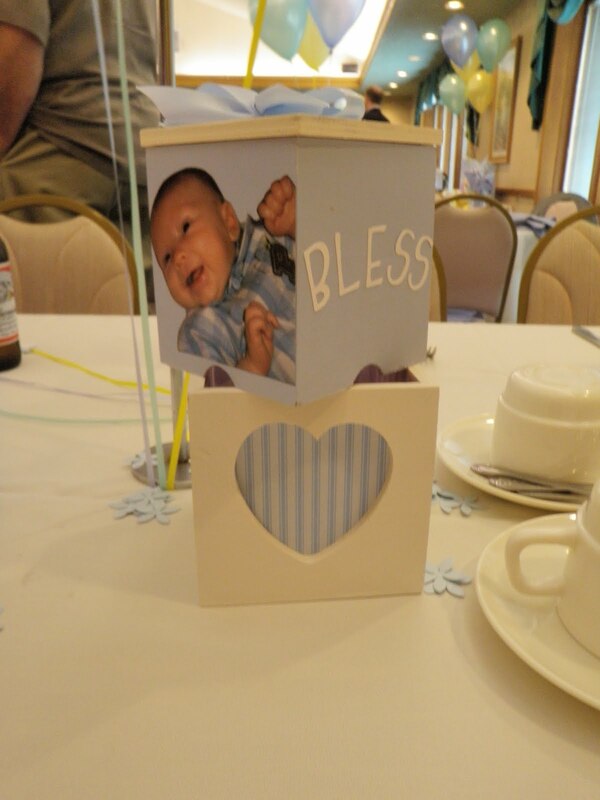 My friend Carolyn asked me to make centerpieces for her son Jakob's christening. She introduced me to my husband.. so I guess I owed it to her (lol). 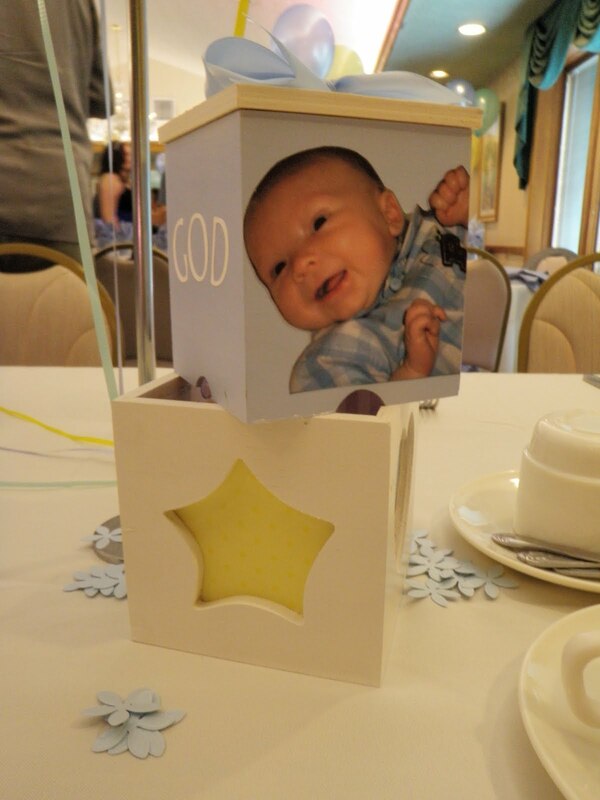 Originally I wanted to make photo blocks with his picture, some crosses and the words "God Bless Jakob". After going to AC Moore we found that the two photo boxes would cost $7 per table without scrapbook paper or anything else. Carolyn being ever thrifty went to the dollar store to find a less expensive alternative. 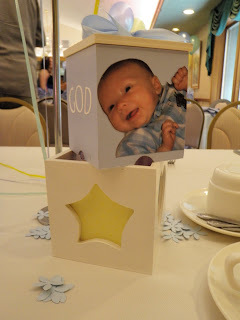 After shopping around she found cardboard boxes with lids in different sizes for $1 a piece, making each centerpiece about $2 per table plus scrapbook paper. I got to work right away on the project. But oh my gosh! First I tried painting the boxes white but the paint peeled off. Then I started again by making square templates out of an old cereal box so that I could cover each box because they came predecorated. 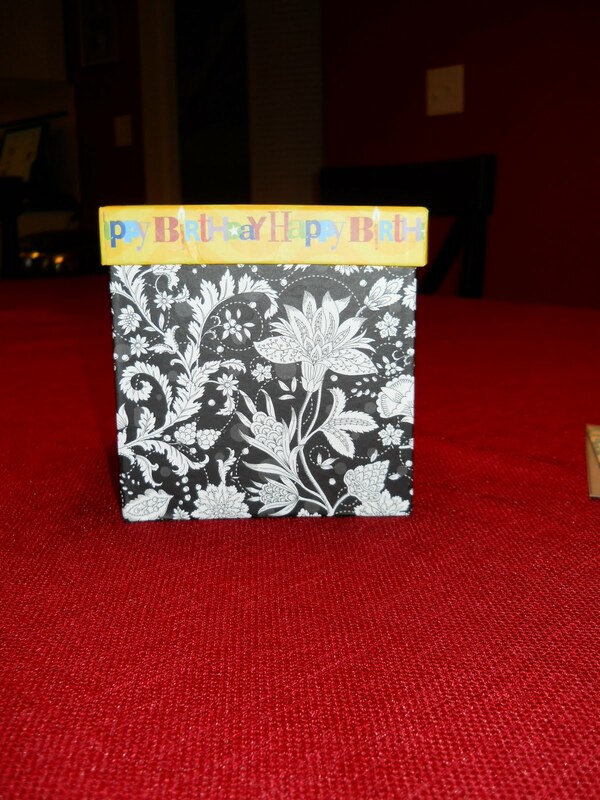 I found some beautiful paper that matched the color scheme that she choose. I thought that the boxes were only 2 sizes so I cut all the paper to those sizes.. only to find out that there were actually 4 different sizes. Now I had to recut some of the paper. 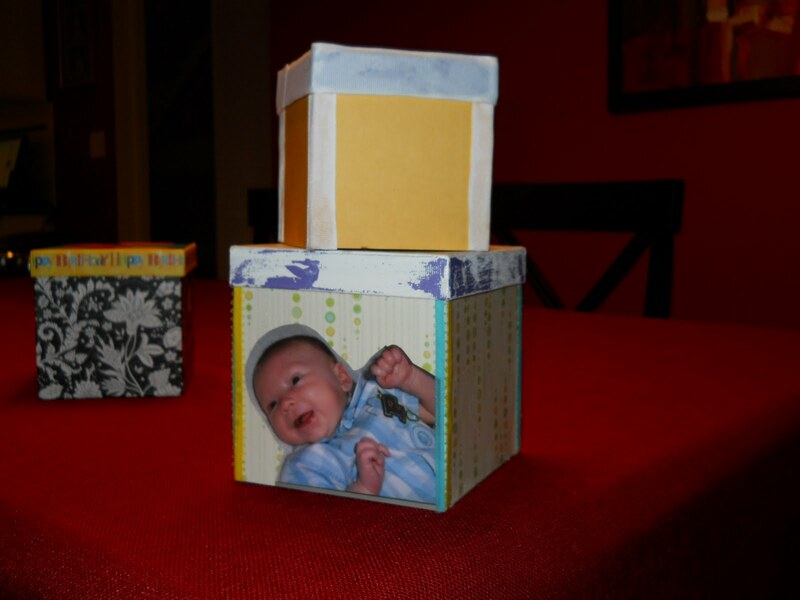 Each of the boxes required 5 squares so I used 2 sheets of paper per box. After finishing just about half of the boxes.. I ran out of scrapbook paper. Thinking I would be able to get more of the paper I covered the remaining boxes with what I could.. so just about 3 sides of each box. 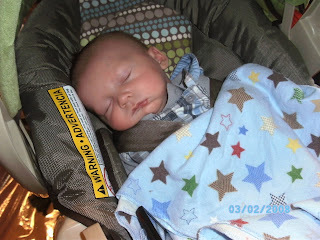 Then I grabbed my crafter in training (my daughter) and we took a trip to Michaels to get more. After searching two different stores and not finding the same book of paper.. we decided that we would have to cover the boxes with solid paper in corresponding colors. Needless to say I finished covering the boxes. 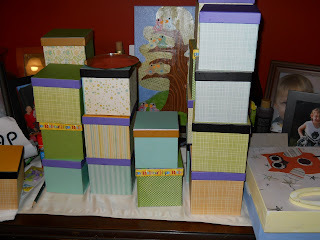 Then it was on to the next challenge.. how to cover the seams of boxes. 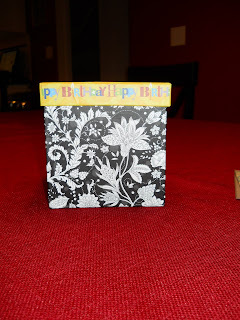 First I tried covering each indivdual corner with skinny ribbon. It has too hard to work with and it didn't always line up right. Next I tried fat ribbon that I could wrap around both sides of the corners. That ribbon didn't lay flat and wasn't always straight. The edge around the top of the box just looked horrible! Ahhhhhhhh! They don't look bad from far.. but are far from good! 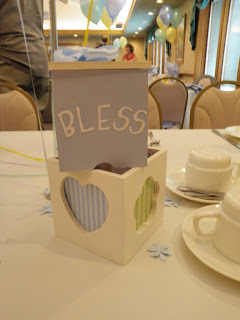 My poor husband came home on Friday afternoon to find his craftmaniac of a wife in a rage because the Christening was on Sunday and I could NOT give these boxes as the centerpieces! Being the saint that he is, he packed the kids in the truck and took us all on a field trip to AC Moore (and pizza dinner!). We walked through the store talking out solutions to my crafting disaster and finally came up with a great one! We bought 7 tables worth.. as that was all they had and then went to another store to get the rest. 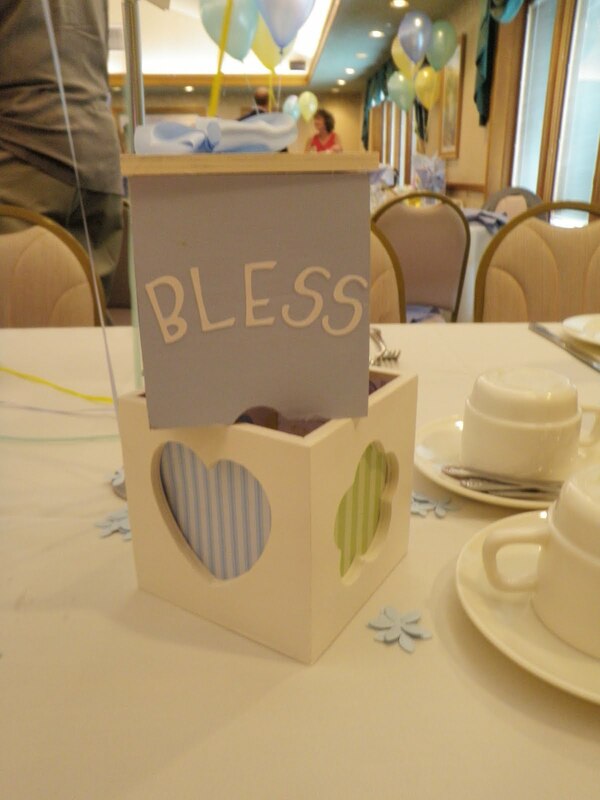 We worked on them for the next 3 days.. yes even the morning of the Christening we were still painting and glueing centerpieces together. Needless to say I arrived at the Christening with blue and white painted fingers. Here is the result! I just loved them! Carolyn loved it too! Yeah! p.s. I still have tons of the cardboard boxes and am still trying to think up fun things to do with them!